Polyarthralgia is when someone suffers from pain in more than one joint, and is always associated with arthritic pain. Diagnosis is difficult due to a wide range of signs and symptoms. Doctors need to review patient histories as well as carry out physical examinations in order to give an accurate diagnosis of polyarthralgia. There are some initial symptoms to watch out which usually happen between the ages of 30 and 50, such as painless swelling or thickening of the skin on your hands and fingers or pain and stiffness in the joints. The main symptom is pain. There is no inflammation in the joints or stiffness, but patients may have a history of intercurrent illness or viral infections. 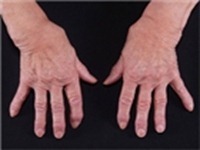 A person will experience at least 4 of the following symptoms for six weeks: pain and swelling in a minimum of three joint areas, subcutaneous nodules, positive rheumatoid factor, joint stiffness in the morning that lasts more than an hour, symmetrical presentation, involvement of metacarpophalangeal joints, proximal interphalangeal joints (knuckle joints) and wrists, and radiological evidence of erosions. This is a non-rheumatoid arthritis that is linked with psoriasis, bowel diseases like Crohn’s Disease or ulcerative colitis, bladder symptoms and anterior uveitis. This can often occur after infections like strep throat, chlamydial urethritis, or bowel infections like salmonella. It is mainly asymmetrical pain with large joint and possible spinal involvement. Sufferers will experience pain in large weight-bearing joint areas as well as the carpometacarpal joint of the thumbs and distal interphalangeal joints of the fingers. There may also be the presence of nodes around the joints. Lifestyle factors play a large role. Those who are overweight, work sedentary jobs, overuse joints or have a history of injury to various joints can all suffer from osteoarthritis. Diagnosing and treating polyarthralgia requires a keen attention to various details. Take a look affected joints or joint areas and also take into account lifestyle, athletic activity and ability, weight, and age. There are many risk factors involved in diagnosis such as previous injury or heavy, repeat use of major joints. The following points show diagnosis symptoms as well as basic treatments for all of the conditions discussed above in regards to polyarthralgia. If you are not experiencing any active inflammation, then consider your affliction to be basic arthralgia. Take simple analgesics or nonsteroidal, anti-inflammatory drugs. If there is more generalized pain or signs of depression, then consider fibromyalgia. For this there are medications that can be prescribed, but mostly lifestyle changes will help. When symptoms are indicative of osteoarthritis you need to become knowledgeable about the problem. Learn about the wear and tear on joints due to osteoarthritis and create a weight loss plan if necessary. Good exercise and analgesics can also help as well as anti-inflammatory medications. Physiotherapy may be needed to slow joint deterioration. Again, lifestyle changes are key. When there is swelling and features of inflammation you need to consider inflammatory arthropathy which is the most common root cause of rheumatoid arthritis. Further investigation into your condition may be needed such as a full blood count to check for anaemia, markers of inflammation like plasma viscosity, rheumatoid factor and radiography of your hands. There is no real cure for rheumatoid arthritis, but Vitamin D supplements can help the slow the deterioration process. If there are no contraindications, then you need to start with a treatment of nonsteroidal anti-inflammatory drugs. If you instate a long-acting treatment you can have more sustained control over your condition. Long term treatments will be needed as well as adequate rest of the affected joints. Occupational therapy may be needed from time to time as well. When rheumatoid arthritis or seronegative inflammatory arthropathy is the diagnosis then be sure to understand the nature of the condition. An assessment by a specialist is highly beneficial. There are several treatments to help slow the progression of these conditions. Nowadays, very few patients become disabled and wheelchair-bound because of this. Start on antirheumatic drugs like sulfasalazine or methotrexate. There are possible pulmonary side effects so it is wise to receive chest radiography before beginning these treatments. You will need regular haematological and biochemical monitoring while receiving these treatments. You will need to see a rheumatologist fairly regularly. The short term use of a low dose oral corticosteroid is often used to treat polyarthralgia. These medications will be administered for anywhere from 6-12 weeks at a time to help relieve and manage symptoms while also slowing the progression of joint deterioration. After your initial diagnosis or initial round of treatment, arrange for a follow up appointment in about four to six weeks. You will need another clinical assessment, evaluation of your home and social circumstances and a refresh on earlier professional advice.